Sandmeyer Steel Company stocks Alloy 400 in the annealed condition in thicknesses from 3/16" (4.8mm) through 3" (76.2mm). Alloy 400, in the annealed condition, exhibits moderate strength. The alloy is also available in the as-rolled condition (Alloy 400AR) which imparts higher strength to the alloy. Alloy 400AR is stocked in thicknesses from .1875" through 3.00". Alloy 400 (UNS N04400) is a ductile nickel-copper alloy with resistance to a variety of corrosive conditions. The alloy is most frequently specified in environments ranging from mildly oxidizing through neutral and in moderately reducing conditions. An additional application area of the material is in marine environments and other nonoxidizing chloride solutions. Alloy 400 (UNS N04400) is a nickel-copper alloy with excellent resistance to a wide range of corrosive environments. It is resistant to chloride stress corrosion cracking and has high strength and toughness over a wide range of temperatures. The alloy is used extensively in many corrosive applications especially in the marine and chemical processing industries. Alloy 400 is readily fabricated by conventional processing operations. Chemical Processing Equipment – in fluorine, hydrofluoric acid, hydrogen fluoride, hydrochloric acid, sulfuric acid, neutral and alkaline salt solutions, caustic alkalies, non-oxidizing halides and dry chlorine service. Alloy 400 is a very versatile corrosion resistant material. It exhibits resistance to corrosion in many reducing environments, and it is generally more resistant than higher copper alloys to oxidizing media. Alloy 400 is one of the few materials that will withstand contact with fluorine, hydrofluoric acid, hydrogen fluoride or their derivatives. The alloy has been found to offer exceptional resistance to hydrofluoric acid in all concentrations up to the boiling point. 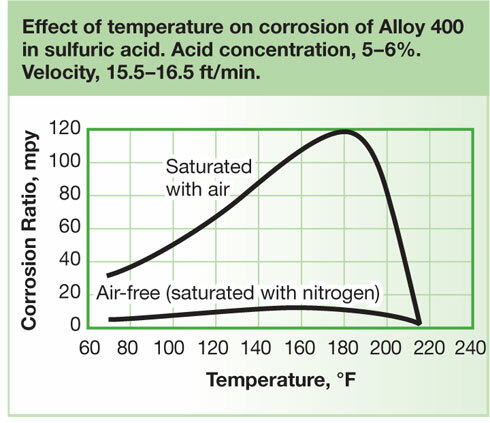 Alloy 400 also resists sulfuric and hydrochloric acids under reducing conditions. It has outstanding resistance to neutral and alkaline salts and has been utilized for many years as a material of construction for salt plants. Alloy 400 is one of the most widely used materials for marine applications, shipbuilding and seawater desalination plants. The alloy exhibits very low rates of corrosion in flowing sea or brackish water. 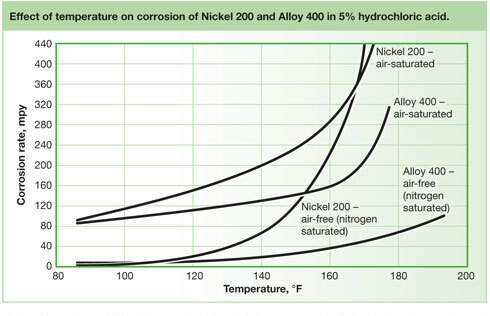 However, under stagnant conditions, the alloy can encounter crevice and pitting corrosion. Alloy 400 resists stress corrosion cracking and pitting in most fresh and industrial water applications. (a) Acid contains 1.5-2.5% fluosilicic acid, 0.3-1.25% sulfuric acid, and 0.01-0.03% iron. Test specimens immersed in solution in storage tank. Temperature, 60-80°F (15-27°C); duration of test, 28 days. (b) Specimen completely destroyed during test. Alloy 400 is readily fabricated by conventional processing operations. Alloy 400 is a relatively soft material that is receptive to hot forming into almost any shape. The range of hot forming temperatures is 1200 - 2150°F (649 - 1177°C). For heavy reductions the recommended temperature range is 1700 – 2150°F (927 – 1177°C). Light reductions are possible with temperatures as low as 1200°F (649°C). Working at lower temperatures will result in higher mechanical properties and smaller grain size. Alloy 400 is readily cold worked by virtually all cold fabrication methods. Cold working should be performed on annealed material. The alloy has a somewhat higher work hardening rate than carbon steel, but not as high as 304 stainless steel. Alloy 400 can be machined at standard rates with conventional machine tools. Surface cutting speeds should be low compared to those used for carbon steel due to the alloy’s high work-hardening rate. Alloy 400 can be welded to itself or dissimilar metals by utilizing conventional welding processes. These include conventional or hot wire GTAW (TIG), plasma arc, GMAW (MIG/MAG) and SMAW (MMA). The choice of welding product is dependent upon the materials being welded and the environment in which it occurs.